Check out the complete line of winter apparel from New Balance on NewBalance.com. 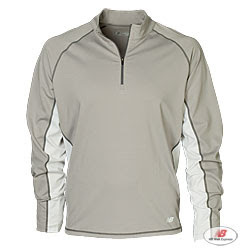 You can tell New Balance did their homework with performance apparel; the entire line is perfect for chilly weather running. And all the apparel allows for great mobility; there is nothing worse than feeling trapped inside your running jacket! I personally am a huge fan of the fleece; it's cozy but not too heavy so you can wear it and still be active. They are also great for layering in the bitter cold. Not only can you easily find information on Winter Performance Apparel, but you can also find updated information on Susan G. Komen for the Cure and the latest New Balance technologies. And, you can get back to NBwebexpress.com via the link at the bottom home page. Just click on the link when you see the "Winter Apparel Collection" message appear.